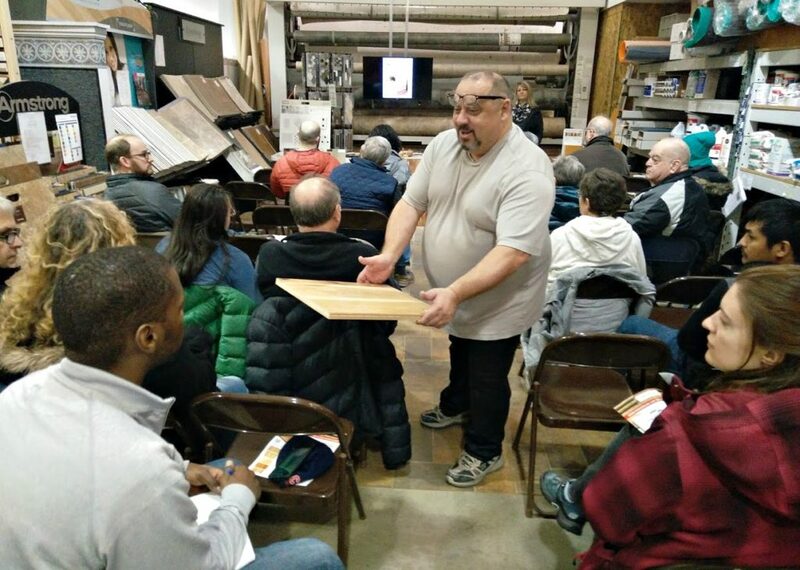 Nearly 30 attendees assembled at Cleveland Lumber Company on March 11 for a deep dive into what’s underfoot during LakewoodAlive’s “Knowing Your Home: Flooring Options” free workshop. Our latest workshop explored the many floor options available to homeowners. Pat and Leslie Rossi of North Coast Floor Coverings provided a presentation exploring the strengths and weaknesses of various flooring options, as well as current trends within the flooring industry. The couple passed flooring examples through the audience while striving to equip attendees with the knowledge necessary to select flooring products with confidence. 1. Know what to expect with hardwood. There are many advantages associated with hardwood flooring, ranging from aesthetic appeal to durability. Still, you have to know what to expect when you install flooring of this type. Traditional hardwood floorboards tend to expand and contract with seasonal temperature variation, and they’re also prone to scratches and scuffs. None of these hardwood traits present a major problem, so long as you have realistic expectations. And engineered hardwood flooring can offer slightly more resistance to everyday wear-and-tear. Vinyl flooring has gained popularity among homeowners in recent years, serving as an attractive, cost-effective alternative to linoleum or laminate flooring. This type of flooring is stain-resistant and tends to stand up well to heavy foot traffic. While common in kitchens and bathrooms, vinyl flooring can work effectively in other rooms as well. 3. DIY can be A-OK. When attempting a DIY flooring project, there are various tips to keep in mind. Test your new flooring in a closet so that you’re experimenting in a place that’s less visible. Consider utilizing loose-linking floors as a practical and easy alternative to using glue or nails. Additionally, it’s generally advisable to install a new subfloor prior to laying flooring, though in some cases skim-coating an existing surface may suffice. 4. Heated flooring is hardly boring. Electric in-floor heating systems are on the rise and have various benefits associated with them. Heated flooring affords homeowners comfort and can also prove more energy-efficient by generating even heating throughout your home. In-floor heating systems work well with ceramic tiles, though other types of flooring can also support this technology. It stands to reason that heated flooring will continue to gain steam among homeowners in the coming years.